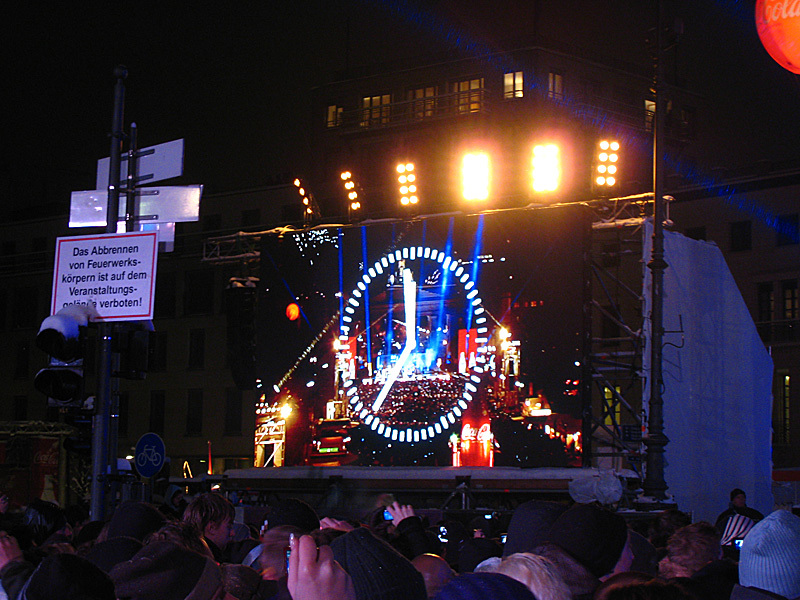 Definition: In Europe, New Year’s is called Silvester. 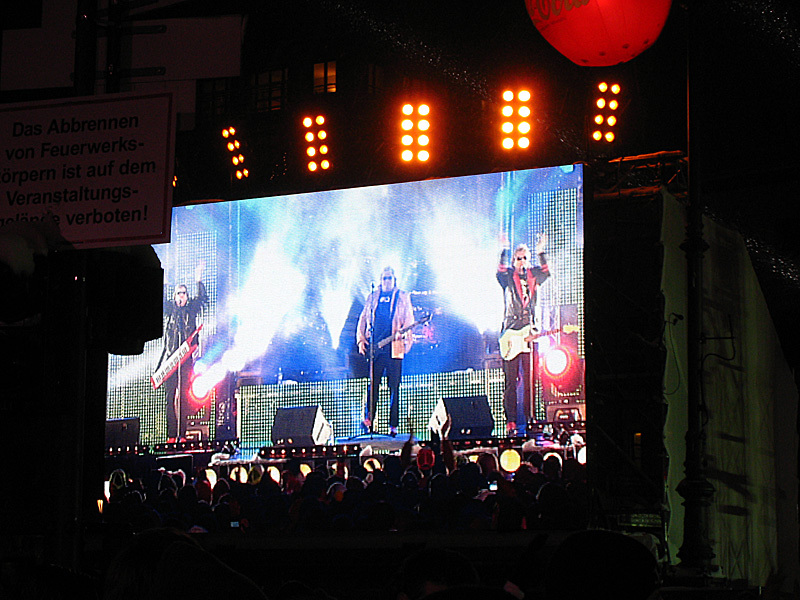 Hence, New Year’s Parties are called Silvester Parties. 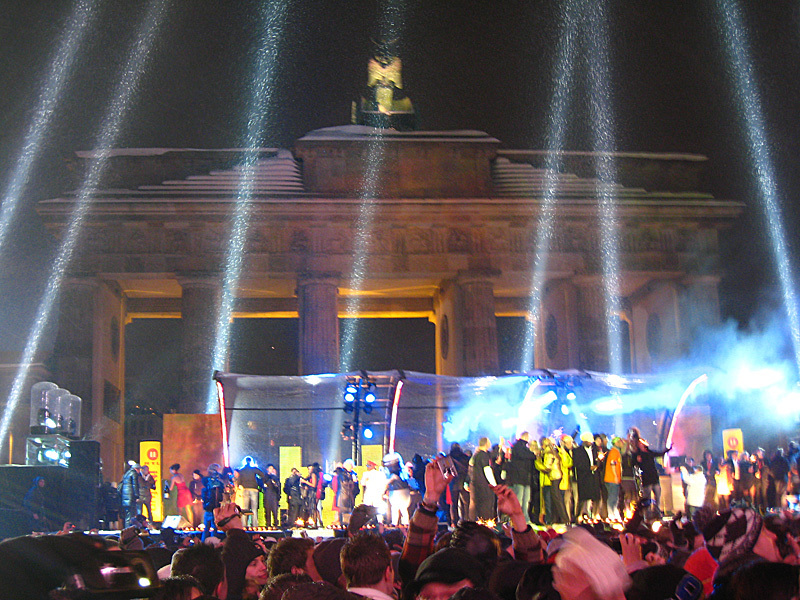 I went to the biggest Silvester Party in the world on New Year’s Eve 2009. Some skeptics say it was number 2 in size, but those nay sayers are doubters. 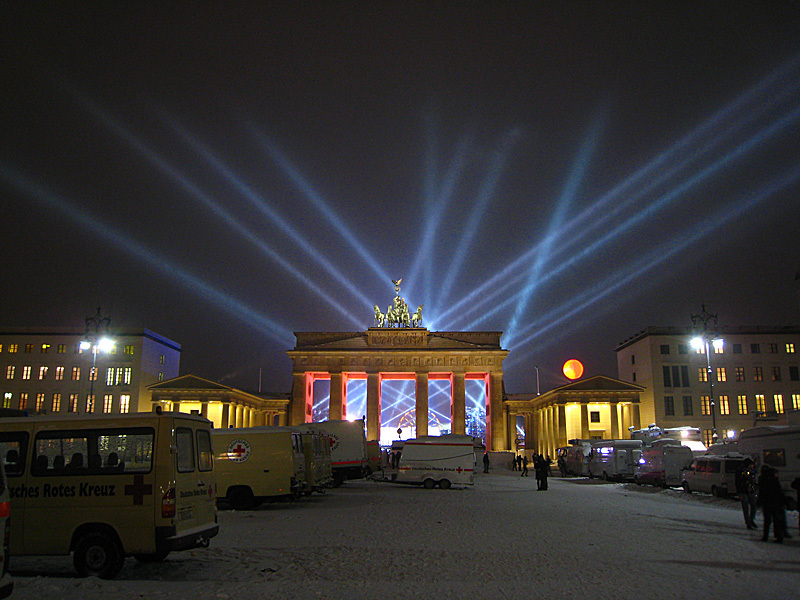 This party was held from the Brandenburg Gate to the Lady of Victory. A distance of more than 1km separates these two landmarks. 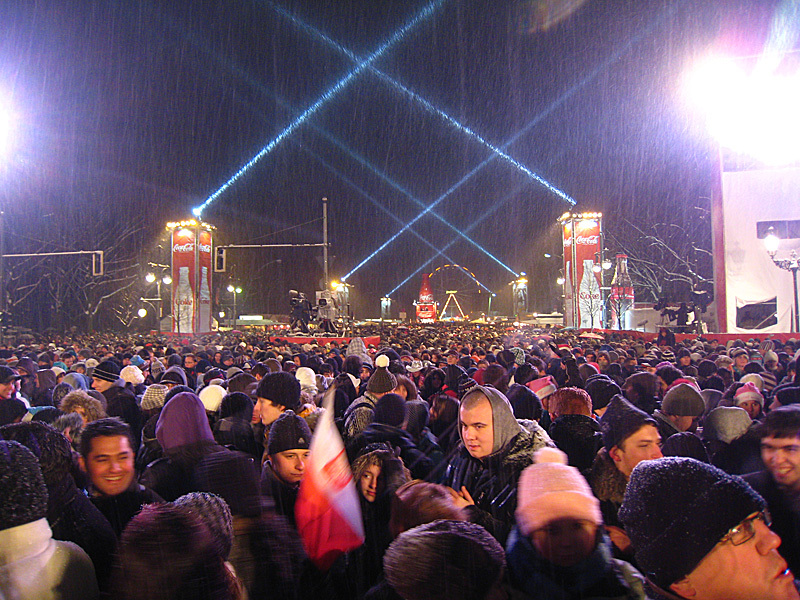 And filling every possible spot in between these two famous monuments: people, thousands and thousands of people. We totaled in excess of 1 million people. And where was I? I came straight from the theatre and arrived around 7:30pm with the intention of checking it out, then going out to dinner with Susanne & Bea, and returning afterward. Let’s just say I never made it out for dinner. It took me some time to figure out how to get into the center area inside the fence, but with a little work and some people skills I worked myself up to the fence to ask those around how to get in. Just as I got there, I feel a push from someone behind me. Turning around, I notice a smiling girl holding onto my jacket. She says, “They wouldn’t let me through, but they let you through, so I came along.” I now had a friend, who brought other friends, to enjoy the party with. Her name was Denise and she and her 3 companions were from northern Germany near Hesse. We made it into the center inside the gates, and the dancing began. They had kind of a ZZ Top homage band play some oldies and new songs, covering some popular party songs and doing their own thing. They got the crowd moving. And the people just kept pouring in. That ferris wheel is about halfway in between the lady of liberty and the Brandenburg. 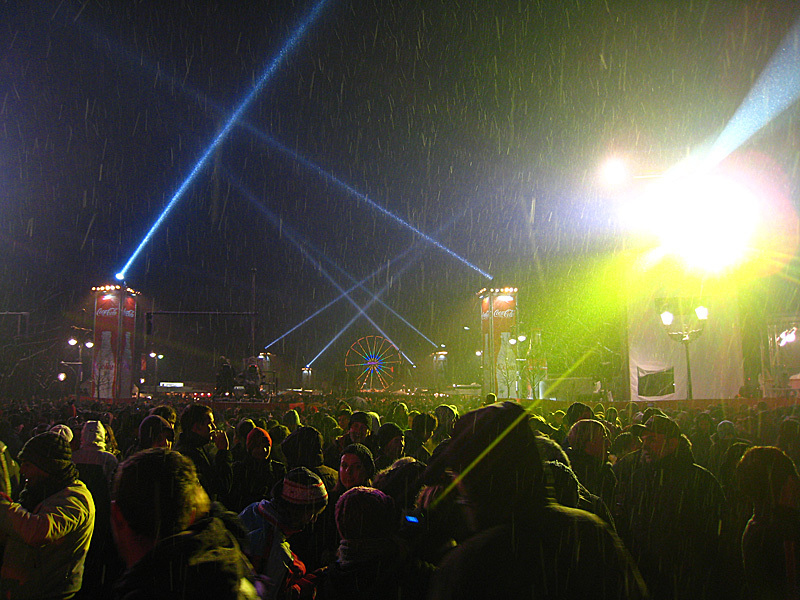 And the snow kept falling, picking up as the night wore on. Eventually, it subsided a bit just after midnight. People of all shapes, sizes, ages, and faces came to this party. I was amazed at how nonviolent it was. 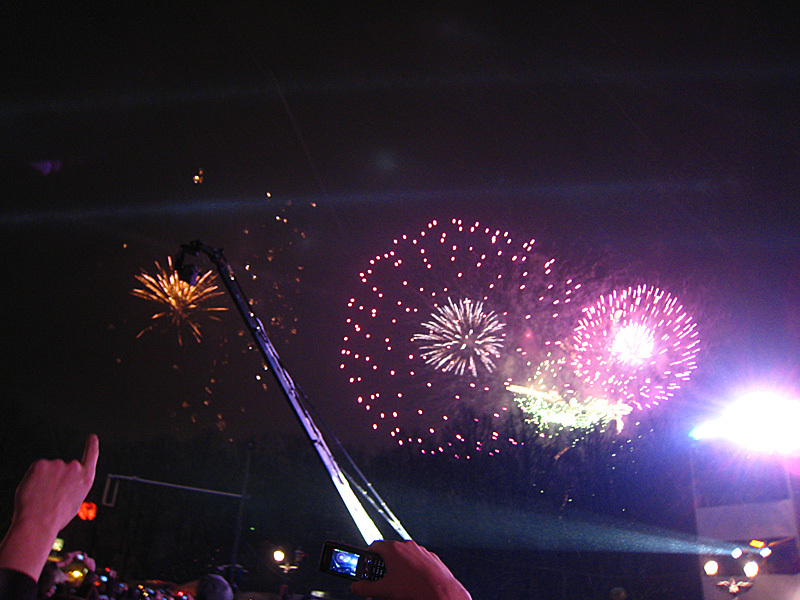 If people ran into someone else, both would turn and give hugs yelling, “Happy New Year” in various languages. 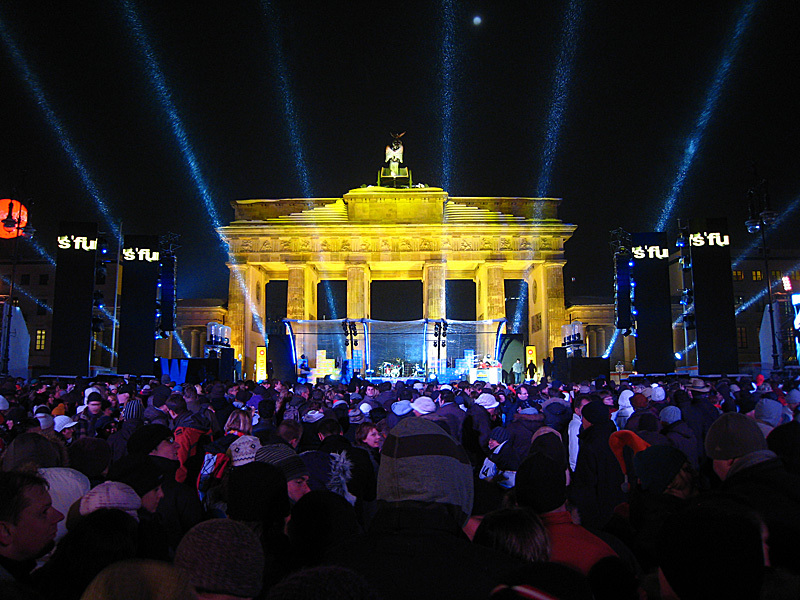 Berlin brought a lot of happy drunks into their city for this party. New Zealanders came, Australians, Irish, Scottish, British, French, Germans, Americans, a whole bunch of people. Those were the ones I met though. The countdown. What is that 24 seconds until midnight? And fireworks! Of course, there were amateur fireworks going on all night. Away from this party, it sounded like a war zone. I didn’t believe Susanne and Bea who told me it was scary and that was the reason they weren’t coming tonight. But on my way to the square it definitely sounded like there were firefights going on just around the corner and all through the city. I was really pleased, and so were many others, as when the clock stroke midnight, they played a set of Michael Jackson’s songs which lasted almost 8 minutes. It was great. 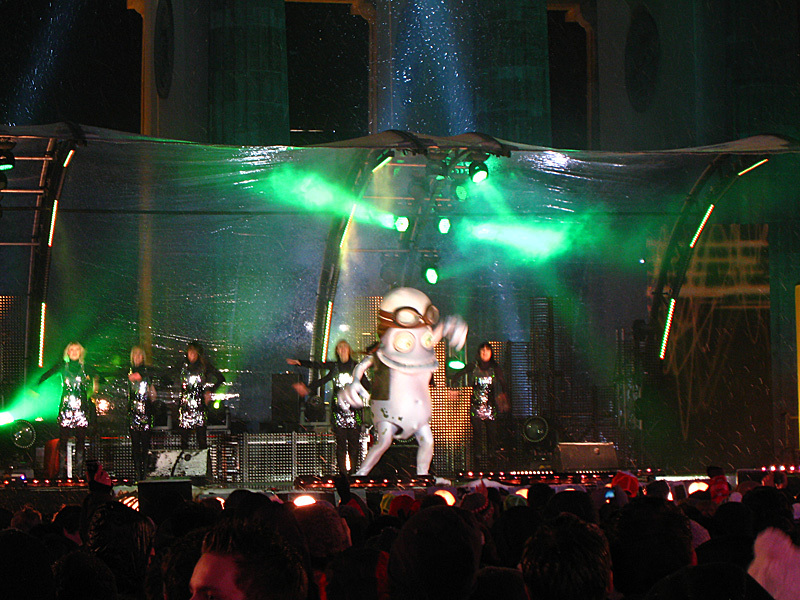 And all the performers jumped on stage to celebrate. 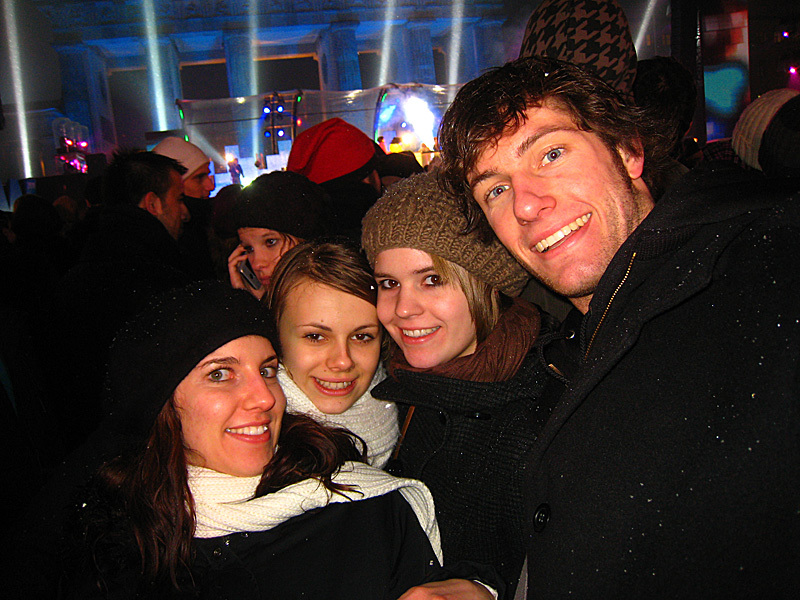 The very fun German girls I spent the evening with. Denise on the left, then Svenja, then Elena, then me. Around 1:30 am the place showed no less signs of people. And the snow kept coming. The bass on the video sounds terrible because it was too much for my camera mic to handle. And when I say too much to handle, I mean it was deep, and pounding on my chest, so that I could feel it more than hear it. Absolutely fantastic. This makes up for me missing Love Fest this year. Kid on the left is from the border of Holland and Germany and his name is Pascal. How cool is that? (maths thing) Elena and Svenja made an appearance in this photo as well. I finally called it a night around 3:45 as I thought I had to be out of the flat in the early afternoon and on my way to Prague. I left some disappointed friends behind at the square. So I danced for almost 8 hours and didn’t eat anything for 12 hours as I had a curry-wurst right before Avatar (15:50) and finally a bowl of cereal when I got back to the flat around 4:15. It was weird though, after 9pm, the hunger just sort of went away, and I ate the cereal because I thought I should, not because I was hungry. All in all, it was an awesome night. I’m thinking about flying back next year. I’m also thinking about the money needed to fly back. Anyway, I made some really fun friends and danced all night. Not a bad way to spend New Years. 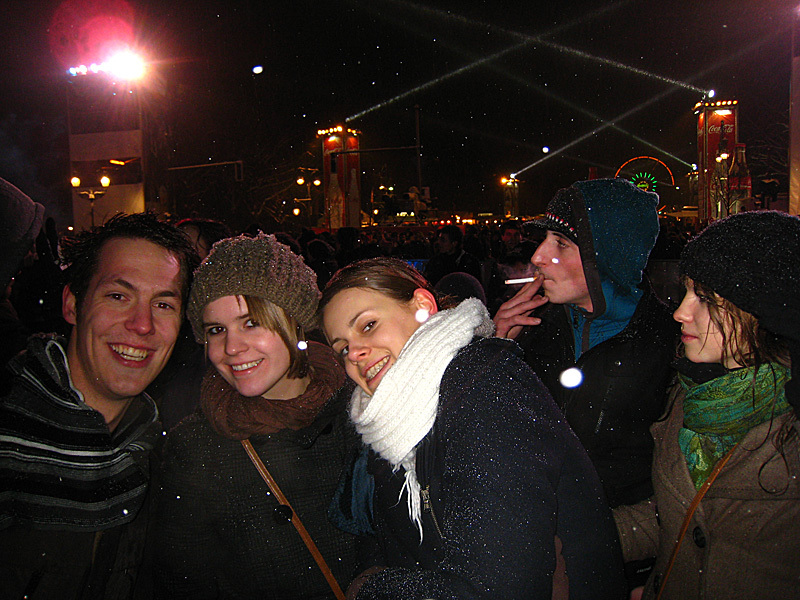 I got some short hours of sleep at the flat and then woke up to a new year: zweitausend zehn. Caleb in 1948 New Years eve I had duty in Times Square New York and it was raining as we arrived on site that later turned to snow and my uniform and equipment became very heavy. By 2AM when we were released and went back to Ft Monmouth NJ. I’m glad you had fun and enjoyed it. I was just 19 at the time.